Melanotaenia rubrivittata beschrieben wurde. . Die Elterntiere habe ich zusammen mit meinem Reisekameraden und Freund Gary Lange gefangen. (M. praecox) in der Attraktivität um Längen schlägt, denn die leuchtend roten Längsstreifen sind sehr auffallend. 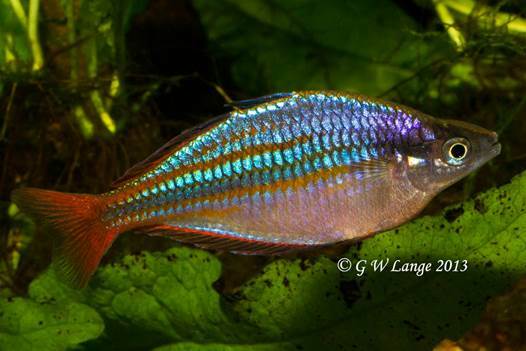 This new rainbowfish from the Wapoga River was initially thought to be a variety of M. praecox. After it turned out that it is an undescribed species, it was described in 2015 as Melanotaenia rubrivittata. The parental fish were caught by me and my travel companion and friend Gary Lange. This extraordinay novelty beats at least the known Diamond Rainbowfish (M. praecox) by far. The red longitudinal lines are very eye-catching.